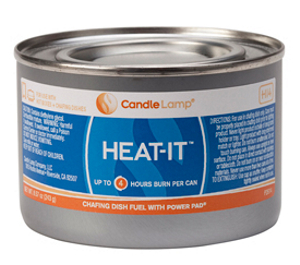 These Candle Lamp Heat-It gel fuel canisters quickly warm foods with a high output thanks to their broad flame and hybrid design. This innovative hybrid design combines the high heating power of gel fuel with the safety and efficiency of wick fuel through a patented Power Pad to prevent spilling, while burning hotter than traditional wick chafer fuels. In fact, with this Heat-It gel fuel canister, you’ll receive up to 4 hours of unwavering heat! Pairs perfectly with our Soup Chafer. This Candle Lamp gel fuel canister features a convenient pop top design so that it can be closed easily and saved for future use. Due to US DOT regulations, this product is ineligible for expedited air shipping. Up to 4 hours burn per can.